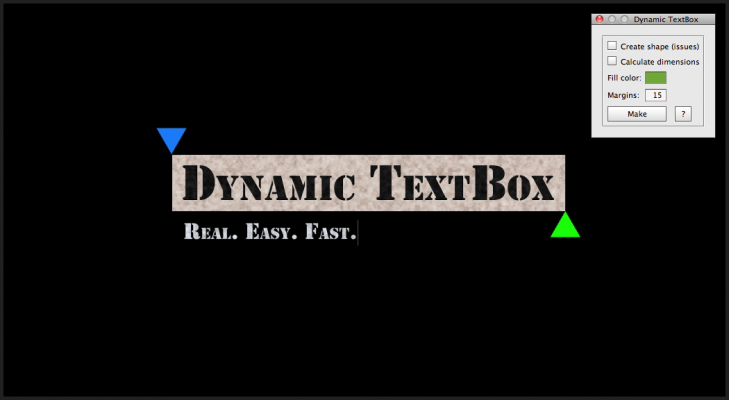 Dynamic TextBox is a solution for Adobe After Effects that allows you to make a solid or shape box under the text layer that always has the same proprtional dimensions as the text it is linked to. It may be very useful in AE templates with variable text (like titles) so that the end user does need to not worry about it. You need to run it only once for one text layer. After it is applied it works automatically when you update the text. As the background you can either have a solid. It's "analog" and lightweight. Also there is a "digital" option that places left-top and right-bottom points of the textbox as controls on the textbox layer. This allows you to use shape layers as a background for example. Unfortunately, this solution does not support text animators because of AE limitations. Shape-box may be not update properly in the comp window, but it will be OK on render.